I went to the local Asian food market a week ago and grabbed every weird thing I could find until my hands were full. One of the first things I grabbed was a durian. 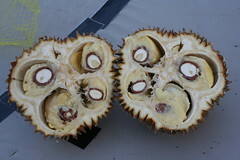 I’d heard about them, seen them on the tubes, and tried durian candy, but I’d never had the pleasure of taking a big, juicy bite out of one. It was disgusting. 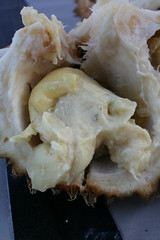 The innards have the consistency of custard. It reeked of rancid trenchfoot smothered in smelly cheeses. 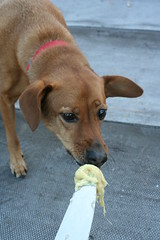 This naturally meant, of course, that it was my dog’s idea of the most amazing thing he had ever eaten. 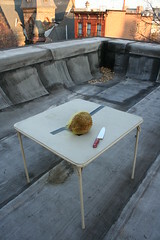 He just kept eating the gooey goodness off of the roof. 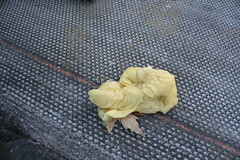 I did take one good closeup of the durian mess (photo below). It looks anything but fruit-like, but I swear it’s fruit. You can view it and the other pics on flickr.